Dom in front of a volcano in southern El Salvador. 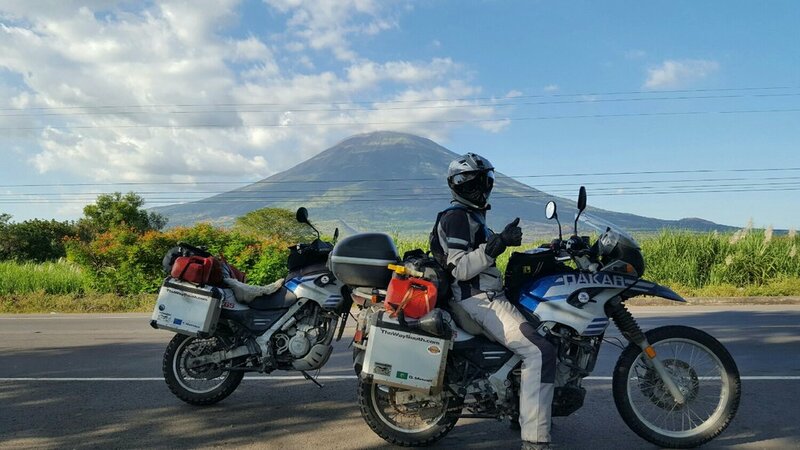 "You know we could have done this trip in a Honda CRV", Dom said flatly after a dinner consisting of papusas (El Salvador's National dish). I stared at him blankly not sure if he was serious. "We could roll the windows down and get the smells, there'd be plenty of room for gear in the back, it's all wheel drive, and it'd still technically be Overlanding". I could tell now that he was serious, "yeah but there is something more romantic about doing it on a motorcycle", I finally replied. I joked with Dom that driving a CRV is the millenial approach to life, pop an Adderall or whatever mind numbing drug was prescribed to you by your childhood shrink/parents who didn't want to deal with you and just coast through life (I know some people legitimately need these drugs please don't stop taking them on account of me). Truth be told driving a CRV down here would be alot easier but then we'd know what to expect everyday, where's the adventure in that? Riding a motorcycle on the other hand is the bipolar approach, the good days are phenomenal and the bad days can be really bad. Volcanoes like this one, Chaparrastique (as best as I can tell from the map). Today was one of the good days in fact the best yet. To be fair there were alot of factors that came together to make today so amazing. El Salvador and much of Central America straddle three tectonic plates the: North American, Caribbean, and Cocos plates. This makes the region one of the most seismologically active areas in the world. El Salvador relies on geothermal power for approximately 30% of its energy needs (thanks fellow ERAU/USAID clean energy specialist Manuel whom we met in Santa Ana). Millions of years ago the action of these plate created a dense volcanic network in El Salvador. Fast forward to contempary times and the government of El Salvador paved roads through the the region. Roads that are currently (mostly) gloriously smooth, compared to the he rest of Central America so far. Today, there happened to be a high pressure ridge sitting off the coast over the Pacific Ocean this brought wonderful clear skies and warm weather (letting us dry our underwear strapped to the top of our bags too). We started the day with a drive around Lake Coatepeque. The lake appeared to be a crater lake with gorgeous Azul waters complementing the light baby blue sky, but contrasting marvelously with the deep green deciduous forest surrounding the lake. The RN-10S snaked it's way around the top of the crater where the road became as smooth as glass then sloped downhill banking towards San Julian. We could have taken the road more traveled to coastal route 2 but that is not what I signed on for. We decided to take the less traveled road through San Julian to the tiny spec of a town called Santa Isabel Ishuatan. I assumed the road there would be gravel but we were pleasantly surprised by the smooth road leading up the escarpment that seperated inland El Salvador from the coast. Steep cliffs met the sky on the sides of the road as we passed through their shadows and those of trees forming a tunnel over the road occasionally the verdant walls would be interrupted by brilliant splashes of bright pink trees in bloom. At long last the Pacific Ocean! Upon reaching the sleepy town of Santa Isabel the map told us we had to head straight though the town. Once reaching the other side the road ran out, and there was a rocky trail. "This can't be right", I muttered and we circled around the town 3 times (much to the locals delight) without finding abother road out. How could that be the road, when the road in was sooo smooth? "Let's do it Dom" said over the intercom. Can you imagine the smoothest/best road you've ever been on? Now think of the furthest opposite of that road possible, that probably doesn't even come close to this road, this goat trail of a road. The road clearly doubles as a stream/river during the wet season. Softball sized rocks rubbed smooth and round from century's of rubbing against each other and rolling down the hill covered hard pan and smooth car length stones. The road was a blast, I fell hard once (bent my pannier gopro footage to come), the front wheels of the bikes would whip, slide, and bounce over every rock making control at any speed difficult to say the least. "We couldn't do that in a CRV", Dom later admitted. 20 km later at long last the road dead ended into the staple of America's Overlanding, the Pan-American highway. After 4,000+ miles we made it to the holy grail of highways for those heading from all the way north in Alaska to the furthest tip of South America or vice versa. This portion in El Salvador was the central American equivalent of California's coastal highway 1. Steep cliffs met the vigorous waves of the Pacific with the road winding along the side or through volcanic out crops. How can any day ending with a view like this be bad? As I lie here in a hammock near the beach, listening to the ocean, reflecting on the trip so far I am reminded of the Jimmy Buffet song. Even the worst days on two wheels in paradise are better than any other day elsewhere (and our tires are mostly immune to "pop tops"). All of this means the best days are even more phenomenal. Tomorrow we will be crossing two borders through Honduras and on to Nicaragua.